A year after former Mayor Bob Filner’s idea for a binational Olympics bid rankled San Diego, the city’s in a better position than ever to join forces with our neighbors down south. To be clear, there isn’t a Tijuana-San Diego Olympics bid on the table. 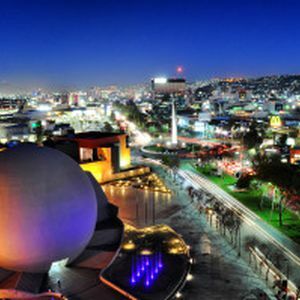 But Tijuana is rapidly becoming a hub of innovation. Even if Filner’s idea was essentially laughed out of the room, the two cities have been marching toward more connectivity. Tijuana’s wheels were turning before Filner hopped on board, though, said Mario Lopez, a binational affairs consultant. In business and culture, that wave has become a force to be reckoned with. Here are a few wins Tijuana has racked up recently. A 10-day conference that started last Thursday at Centro Cultural Tijuana, showcases the region’s progressive ideas in tech, health, environmental issues and design – all of which represent big opportunities for San Diego. This is easily the flashiest example of cross-border collaboration. All told, the conference “draws more than four times as many conference-goers as Comic-Con” with support from “San Diego-area government, business and educational leaders,” according to organizers. This is the third iteration of Innovadora: The first was in 2010, and more than 500,000 people showed up for the 2012 edition. This year’s confab boasts a VIP list of speakers and attendees: former U.N. Ambassador Bill Richardson, former New York City Mayor Rudy Giuliani, Tel Aviv Mayor Ron Huldai and San Diego's Mayor Kevin Faulconer. On the tech side, Google, Mozilla and MIT will have reps on-site for Campus Link to attract and advise younger attendees from both sides of the border. A mega hackathon intends to set a Guinness world record with 3,000 people programming at once. Faulconer is set to join Tijuana Mayor Jorge Astiazarán on a panel. In a press conference last month, Faulconer tried to rally San Diegans to make their way south. Last month, U.S. border authorities opened all 25 northbound lanes at the San Ysidro Port of Entry. Instead of the usual two to three hours spent waiting to cross the border, weekday traffic sailed through. Otay Mesa broke ground in June on its side of the $78 million cross-border terminal that’ll make it much easier for San Diegans to fly out of Tijuana’s General Abelardo L. Rodriguez International Airport, which should be done sometime next year. Construction on the Mexican side of the terminal has been under way since September 2013. Some 2.4 million travelers from the U.S. already use the Tijuana airport each year and backers of the new cross-border terminal estimate about 1.7 million TIJ passengers will use their facility every year.